Adolf Mišek (1875-1955) was a Bohemian double bass virtuoso whose career was in Vienna, where he was a student of the eminent Franz Simandl. In time Mišek became a member both of the Vienna Opera orchestra and the city’s Philharmonic, the two most prestigious positions in the Dual Monarchy. With the dismemberment of the Empire, Mišek travelled back to the land of his birth and spent the remaining near four decades of his life in Prague, firstly as principal bassist in the Orchestra of the National theatre, and then as a freelance musician and composer. I’m indebted to Szymon Marciniak’s booklet notes for these details. 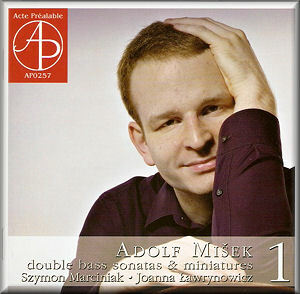 Simandl was one of the most distinguished and influential bassists of his time, but Mišek – though he took over the older man’s teaching position at the Conservatory on his death – never established the same kind of influence. Nevertheless he did compose for his own instrument and the fruits of that career, carried out concurrently with his orchestral and operatic duties, can be enjoyed in the first of a two volume retrospective. The Sonata No.1 was written in 1905. Banish thoughts of Zemlinsky and Strauss. It opens with a zippy Schubertian march theme and lashings of Viennese charm. The piano trips daintily, the lyrical themes – nicely apportioned to the big beast of the double bass – are full of witty contrast. For the slow movement we visit rather religiose territory, reflective and warm. Szymon Marciniak manages to spin a succulent legato with fine tonal resources and he clearly enjoys the frolicsome Polka that launches the finale. Here Mišek modulates adeptly, feinting into a fugato, but one remembers most the truly lovely B section. Six years later he completed his Second Sonata, and this is a different work entirely. The aura is clearly Brahmsian, and the urgent late-Romanticism that courses through its veins is very much removed from the genial effervescence of the earlier sonata. Vocalised charm animates the slow movement; Mišek is extremely good at delightful and contrastive B sections, as again here. There’s a vaguely Dvorákian Furiant-as-Scherzo and then the finale reverts to Brahms, slightly clotted textually, but full of incident and rhythmic verve. The programme bisects the two sonatas with a brief 1903 Concert-Polonaise, music to the ears and fingers of the Polish team of Marciniak and Joanna Lawrynowicz. Slightly generic it might be, but it has a real sense of dignity that I like very much. And, whilst it makes demands, it doesn’t revel in obvious virtuoso flourishes, which is all to the musical good. This is a most pleasant revival, engagingly played, and well recorded.